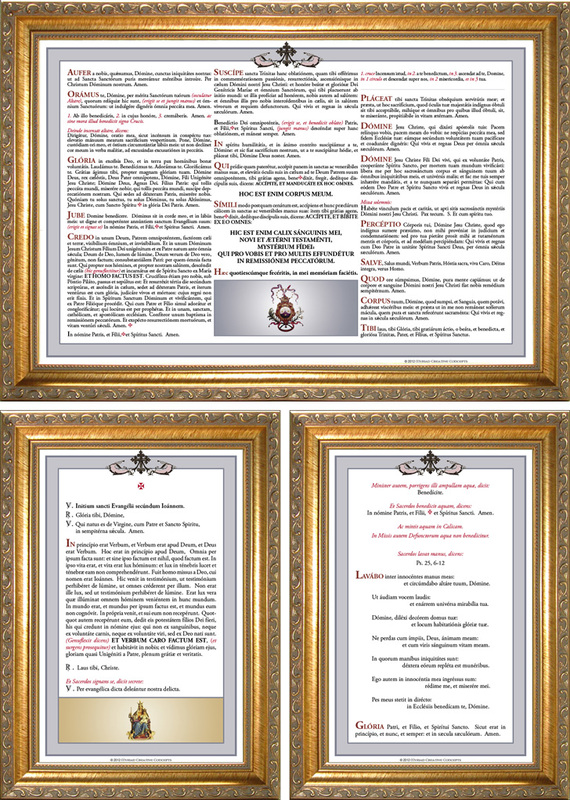 Myriad Creative Concepts designs, manufactures, and sells traditional, beautiful, easy to read Latin and English Altar Cards for the Catholic, Anglican, Anglo Catholic, Old Roman Church, and Orthodox Western Rite Masses. Hello everyone. Recently, I was asked to try to replicate a very old Roman Catholic Latin Sacristy Card for a customer. This Sacristy Card contains the Prayers Before and After Mass in Latin with diacritical marks to assure proper pronunciation. It turned out very nice and I thought that it would be a nice gesture of appreciation if I offered it free for a limited time as a downloadable PDF file from my website, Myriad Creative Concepts. The link is right in middle of our Myriad homepage in the "P.S." paragraph. This beautiful Prayers Before and After Mass card was originally put on the market in 1923. I did the best that I could to replicate it. It is very large, measuring 18 inches wide and 15.75 inches high. 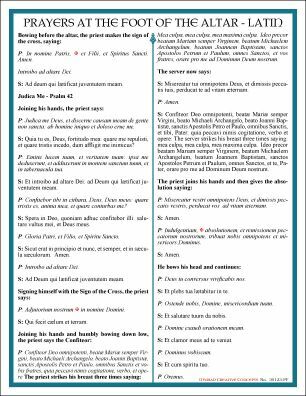 Feel free to download it while it is available for download and have it printed and framed for your own church's Sacristy. That's it for now. Take care. And, as always, thank you for your continued support of Myriad. Hello everyone. There are many items necessary to prepare for and to celebrate the Roman Catholic Tridentine Latin Mass. Here at Myriad, we specialize in those materials and supplies relating to the variety of Latin Mass cards that are needed. From design to sales, we try to provide what is needed and wanted by priests. The following is an overview of what we offer. Pictured above is our flagship set of Latin High Mass Altar Cards, "Vintage Diamond." This is our most popular set among many. High Mass altar cards include the extra three incensing prayers necessary to celebrate Solemn High Masses. 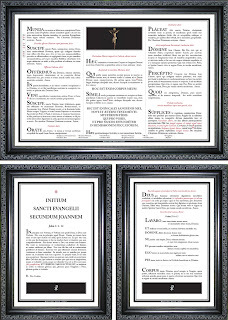 This design incorporates historic altar card liturgical art combined with sharp, clear, easy-to-read Latin prayers in a layout that is most practical according to what our customers have told us they need and want. 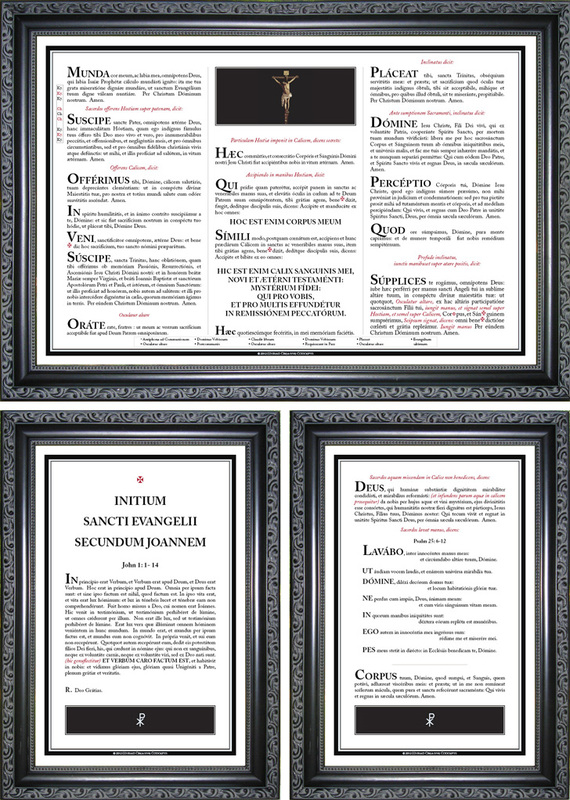 Our other categories of Altar Cards include Low Mass, Requiem Mass, Travel Mass, large print, and "Starter" altar cards for priests new to the Latin Mass. Again, we have designed a number of choices in the these categories to choose from. All of them are available as print, laminated, or framed versions. A priest prepares to celebrate Mass in the Sacristy. 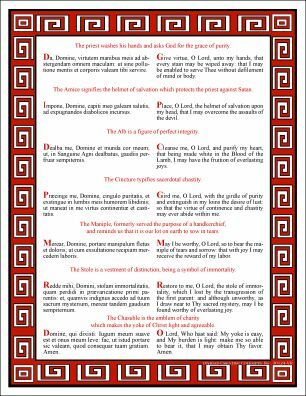 Probably the most commonly requested card is our red "Vesting Prayers" card. However, we have several other Sacristy cards to choose from as well. Once a priest leaves the Sacristy to celebrate Mass, there are a few companion cards that he refers to besides the altar cards. Probably the most commonly requested among these is our card, "Prayers At The Foot Of The Altar." Some of the companion cards that we offer are the direct result of priests calling us and suggesting a specific card to be designed to make it easier for them to celebrate Mass. These custom-designed cards are so practical that we have included them for sale to other priests too. 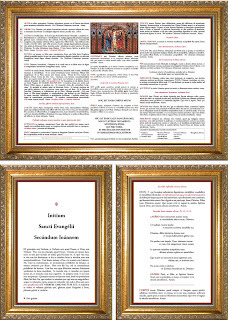 Refer to our website to read the details about these unique Latin Mass Companion Cards. To celebrate Mass on the road, we offer both Low Mass and Requiem Mass altar cards in smaller, briefcase-sized versions that are laminated. 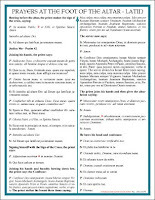 In Catholicism, there are a few branches or Rites that require their own unique prayers on their Latin Mass cards. By request, we designed and now offer beautiful altar cards for the Bragan, Carmelite, and Dominican Rites. These cards are some of the nicest ones that we have created so far. 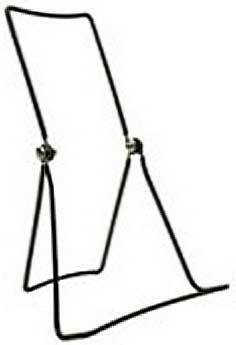 Lastly, to support altar cards on the altar, we offer inexpensive but durable altar card stands. They fold up nicely for storage and are strong enough to hold both laminated travel sized altar cards as well as framed sets on large home church altars. For more information about our wide selection of Latin Mass materials, feel free to visit us online at our regular business website, Myriad Creative Concepts. And, as always, if there is something that you need but cannot find, let us know and we may be able to custom-design for you. Hello everyone. Today, I would like to announce the revision of our Roman Catholic Latin High Mass Incensing Prayers card. This "Gold" version is a 5 x 7 inch card with the three Incensing Prayers in large print with an attractive gold border. This is the version that we will be offering for sale when we run out of the present "Roman Pillars" version presently listed on our website. When celebrating the Tridentine Latin Mass, a priest can use High, Low, or Requiem altar cards depending on the Mass to be said. A set of High Mass altar cards will include the extra three Incensing Prayers and can be used for Low Masses too. But, if a priest has Low Mass altar cards, he will need to read the Incensing Prayers from another source. This small card laid flat on the altar would be ideal for situations like that. 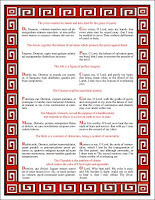 Our present, Roman Pillars version is a very nice card. Its artwork is attractive but its print is only 12 points. For most priests, the 12 point type is just fine but for those with poor vision, we wanted to revise the card to suit their needs too. Plus, a card with a more generic border would go better with a wider variety of art on a priest's altar cards. So, this revised design is going to be the one we run with. If you are interested in this large print version and would like to order it specifically before we run out of the Roman Pillars version, just include a note when ordering from our regular business website, Myriad Creative Concepts, and we will substitute with this new revised card. That's it for today. Have a great week everyone! Hello everyone. Today, I would like to announce the release of Starter Altar Cards for seminarians and new priests to celebrate High, Low, and Requiem Masses. A priest new to the Tridentine Rite made some cheat notes and asked us to design special sets that include them. For High and Low Mass, we designed a set called "Blue," pictured above. This set includes a list of Kyries on the top left portion of the center card. Next, there are places on the center card that are underlined to cue the priest to bow. On the bottom of the center card, a list of elements immediately after communion is listed for easy reference. Lastly, diacritical marks have been added so that the new priest can be sure to pronounce the Latin words correctly. Like most of our High and Low Mass altar card sets, the first part of the "Supplices" prayer is listed on the center card. (The remainder of the prayer is to be read from the altar missal.) Also, the Lavabo card contains the full text of the "Corpus tuum" prayer. For Requiem Mass, we modified our "Formal Black" set to include cheat notes. This set includes the Kyries on the top left portion of the center card and the list of communion elements on the bottom. It also includes diacritical marks. 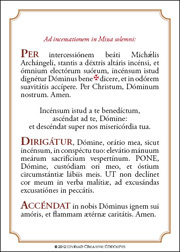 This set of Requiem cards also includes the full text of the "Supplices" prayer on the center card and the "Corpus tuum" prayer on the Lavabo card. These two sets are arguably the finest sets of altar cards available for seminarians and new priests thanks to the ingenuity of our customer who took the time to make his cheat notes and asked us to design these sets to his specs. 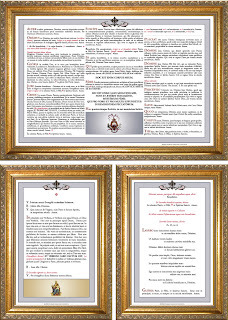 For more information or to see our wide selection of Latin Mass cards, visit us online at our regular business website, Myriad Creative Concepts. These two sets are temporarily listed among our New Releases and will be on sale for a while. On Thursday, May 17, 2012 at St. Joseph's Church (416 3rd Street, Troy, New York) Father Romaeus Cooney O. Carm. used the historic Missale Carmelitarum for the the Feast of the Ascension. This was a Missa Cantata according to the Rite of the Holy Sepulchre; the rite of mass proper to the Order of Carmelites. This form of the liturgy was not been celebrated publicly by any priest in the Order of Carmelites since adopting the Roman Liturgy in 1972. From the very beginning of its existence Carmelite liturgy has been connected with the Rite of the Church of the Holy Sepulchre in Jerusalem. For centuries, in all the official documents, the Liturgy of the Carmelites was described as the "Rite of the brothers of our Blessed Lady of Mount Carmel according to the custom of the Church of the Holy Sepulchre in Jerusalem". The Holy Sepulchre is important for Carmelites not because it was the site of burial for Jesus but because it was the place of the Resurrection. The Rite itself comes from France as it was brought to the Holy Land by French crusaders. There is also influence from the Augustinian tradition as the Canons of the Holy Sepulchre followed the Rule of St. Augustine. It was this liturgy that the Carmelites took as the source of their inspiration. Different Carmelites who have studied our liturgy suggest that the Carmelites from the earliest times on Mount Carmel celebrated the Rite of the Holy Sepulchre. The first written proof of this is in our Constitutions of 1281 from the London General Chapter. These Constitutions are important for a number of reasons since they are the earliest Constitutions to survive. It is suggested that the Carmelites of that time formally adopted what was already their custom since the days on Mount Carmel. -Francis Kemsley O.Carm. We celebrate this form of the Carmelite liturgy as part of the living tradition of the Church and the Order of Carmelites, in accordance with the Apostolic Letter Summorum Pontificum and the instruction Universae Ecclesiae (Ref, art.34). It is our hope that this treasure of the Carmelite Order, and this historic liturgy of the Church will continue to nourish the lives of the faithful. in his presence I live." Here is the link to the web page where you can view the pictures of taken during Mass.